Of course, everyone will be familiar with the fun-loving film Madagascar. I was excited to have been given the opportunity by Sarah of going to the press launch day of the musical adaptation. The show will begin its tour at the New Wimbledon Theatre from July 21st starring 2016 X Factor winner, Matt Terry as Alex the lion. Madagascar the Musical is set to be a vibrant and entertaining show for the whole family. Madagascar is about four zoo friends, Alex, Marty, Gloria and Melman who escape their home in Central Park Zoo and end up on an adventure in Madagascar, home to King Julien. The show, from the same creators as Dreamworks’ Shrek the Musical, will feature iconic songs including “Move It”. The launch day took place at 3 Mills Studios and as I arrived we were immediately greeted with drinks which is a great way to start the day. We were told not to take any videos due to professional videos being released later in the week, but this allowed me to soak up the atmosphere of the performances. Inside the studio the area was laid out as for the stage with scenery and props which will be used in the show. We were introduced, by host Ian Brown, to the opening number from the show called “Show Time”. It was energetic and visual which is what you expect from Madagascar. Each character had their own introduction and the cast embodied the characters extremely well, with their own individual flare. I enjoyed the flamboyance from Marty, played by Antoine Murray-Straughn, the sass from Gloria, played by Timmika Ramsay, the nervousness from Melman, played by Jamie-Lee Morgan and the sense of strength and showmanship from Alex, played by Matt Terry. The excitement from the cast was palpable as they were finally able to show off the hard work they have clearly put in at rehearsals. A Q&A session, led by Ian Brown, then followed with cast members and creatives. During the Q&A we were introduced to one of the puppets from the show which will be one of the main selling points. When the cast performed “Move It” later it was great to see how the puppets bring the song to life. 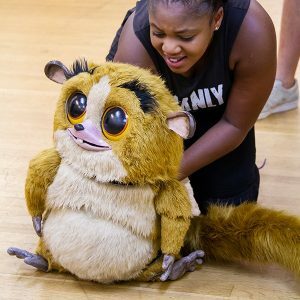 The puppets will most certainly be a highlight of the show and Jo Parson who plays King Julien really does the character justice. Emma Brunton, (puppetry), explained ‘There is a diverse range of puppets. The cast embody the movement of the characters, each has a different trait as of the movie’. The puppetry reminded me that of The Lion King and definitely has the same style as Shrek. I was amazed to know that this was the first time the cast have performed the show to an audience, and as the Director, Kirk Jameson, says ‘this show is completely restructured. This version has never been performed and has new songs’. Once the performances had finished, we were taken outside and I was able to have a one-to-one interview with Matt Terry. It was great to see how excited he is to be able to begin the tour and how he has embraced the world of Madagascar and his character. Are there any differences or surprises we can expect from the musical compared to the film? Throughout the whole musical you’re going to see very iconic scenes, songs and speeches from the movie. There’s some really cool moments in there exactly like the film. However, I think there’ll be a nice surprise from the songs, costume and the set. What’s your favourite part about playing Alex? My favourite part is probably being the King of New York City. It’s pretty epic to do and he’s got some cool numbers, his songs are amazing and the choreo is great. He’s a very exciting role to play. Have you adapted it differently from the movie? The first we were taught was, ‘if Alex was a human who would he be’ and taking that on board really has helped to embody the character. How has it been interacting with cast members within the show? The cast are amazing, I’ve made some really close friends here. We’re all a very tight bunch and all get along. The only struggle really at the beginning was the puppets just because we were looking at the actors’ faces instead of the puppets’ mid scene, but now we’ve been taught and shown how to respond it’s become second nature now. What is your favourite number to perform? At the moment, probably the two you’ve just seen: “Showtime” and also “Move it”. It was great to see how excited Matt was to be able to begin the tour and how he has embraced the world of Madagascar and his character, Alex. I would easily give the day a 5 star, mainly due to the fact of being able to experience the puppetry work being brought to life. If you get a chance to see the show I would definitely recommend it. I certainly plan to go. And to quote Matt Terry’s own words “everyone’s in for a treat”. Stay tuned to the blog to read Musical Theatre Musings review of Madagascar following press night at Wimbledon. To find out more about the show and book tickets visit their website. If you like this article you might also like my review of Heathers, Matilda and School of Rock.